A medical power of attorney grants to someone you choose, the power to act on your behalf in relation to medical decisions. A Medical Power of Attorney grants to someone someone else, the power to act on your behalf when it comes to medical decisions. A Medical Power of Attorney covers medical care decisions only and often only for the period of time during which you are unable to make these decisions for yourself. A Medical Power of Attorney legally authorizes a specified person, the ‘Attorney-in-fact’, to make health care decisions and handle medical issues on behalf of the 'Principal', who is unable to do so themselves. It can allow this trusted person to continue acting on the principal's behalf even if they become incapacitated or unable to communicate their medical wishes. If there is no power of attorney in place and an unfortunate set of circumstances leaves a person unable to consent to medical treatment or make important medical decisions for themselves, their family or friends may need to go to court to obtain the authority to handle that person's medical affairs and make these decisions on that person's behalf. Attorney-in fact: The person you appoint to handle your medical affairs can be referred to by a variety of names, including: ‘attorney-in fact’, 'agent,' or 'representative', or similar. This person is legally obliged to follow the principal's treatment preferences to the extent that they know about them. Pre-Arrangement: The document authorizing Medical Power of Attorney can be drafted in advance of incapacity, so that this power of attorney becomes immediately effective upon the principal becoming incapacitated, or it can be effective for the duration of a person's disability, regardless of capacity to communicate. Incapacity: This refers to the principle being injured, ill, or disabled such that they are unable to communicate or express their wishes or manage their own affairs. Another estate planning document called a 'Living Will' or 'health care declaration' is a critically important complement to every Medical Power of Attorney. In fact, some states allow a Medical Power of Attorney and a Living Will to come in the form of one document. Many states, however, require them to be executed separately. A Living Will only gives specific directions with regard to what life-prolonging treatment you want to receive if you fall into a persistent vegetative state and death is imminent as determined by your physicians. Do you want to be kept alive as long as possible or be allowed to pass away naturally? A Medical Power of Attorney, on the other hand, applies in every other situation. What’s more, if you don't have a Living Will in place, your Attorney-in-fact, will be able to make decisions for you regarding life-prolonging treatment as well as. Create a free Medical Power of Attorney in minutes with our professional document builder. 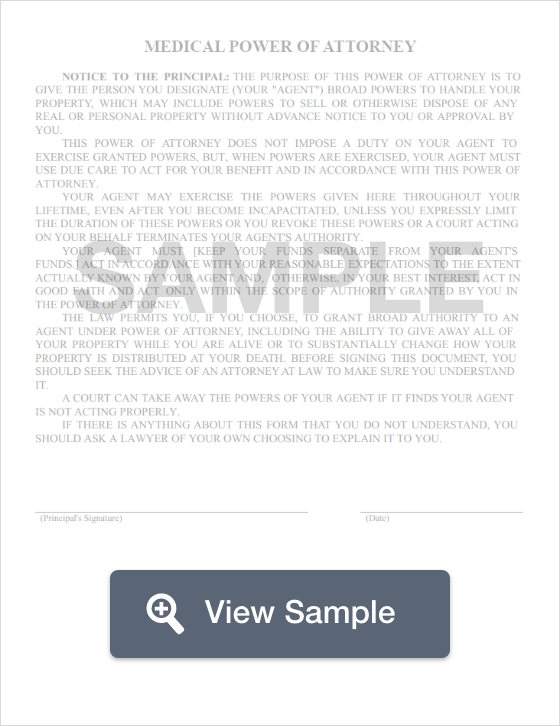 What Can You Use This Power of Attorney Form For? Do You Need a Medical POA? A HIPPA Release: This will allow your health care provider to talk freely with your Attorney-in-fact so that he or she can understand your medical situation and the choices you have and have access to your medical records. Optional guidance for your Attorney-in-fact: Here you can express your goals regarding the making of medical decisions if when you become terminally ill and or have some other extreme situation. Which is most import to you, comfort, preserving your mental functions, or staying alive as long as possible? How aggressively do you want to be treated if, for example, you have severe brain damage or brain disease, a stroke, or severe Alzheimer's disease or mental health issues? A Living Will or advance health care directive: These are instructions to be followed by your Attorney-in-fact and doctor if you become permanently unconscious or have an end-stage medical condition. Do you want aggressive medical care to preserve life for as long as possible, or is comfort and quality of life more important to you? Notarization language: Some states require a Medical Power of Attorney to be notarized. In other states, notarization is optional. Once your medical power attorney has been completed and filed, make sure that all of the necessary parties have copies. This includes, primarily, your doctor, agents, and any family members who you think should know about your wishes. Who should I choose as my Attorney-in-fact? The person you nominate to be your Attorney-in-fact should be someone you trust and who knows your wishes, values, and beliefs. You should be confident that this person will be capable of making health care decisions on your behalf according to your instructions and always in your best interests. Can I choose more than one Attorney-in-fact? Yes. In fact, it is good idea to nominate one or more alternate Attorneys-in-fact in case your primary Attorney-in-fact is incapable or unavailable to perform his or her duties under your Medical Power of Attorney. To what extent is an Attorney-in-fact liable for a decision they make under the authority of a Medical POA? Your attorney-in-fact, acting in good faith, is not legally liable for any health care decisions made on your behalf under a Medical Power of Attorney. The scope of a Medical Power of Attorney can vary from state to state. Thus, you can only delegate powers to your Attorney-in-fact in accordance with the rules and regulations of the state in which they are to be applied. To be valid, a Medical Power of Attorney may also be required to include specific language that is required by the laws of the state in which it is executed. Some states will allow you to combine your Medical Power of Attorney with other 'advance health care directive', such as Living Will. A Medical Power of Attorney can be revoked by the Principal at any time while he or she still has the legal capacity to act. If, however, the Principle become incapacitated before revoking the Medical Power of Attorney, someone with his or her best interests in mind (such as a family member, close friend, or business associate) will need to petition the local probate court to become the Principal's appointed 'conservator' and to revoke any pre-existing Medical Power of Attorney. If none of the above individuals are available and willing to serve as your health care surrogate, your attending physician can choose any other person or entity including a public agency, public guardian, public official, corporation, or any other other person or entity permitted by law. Medical power of attorney delegates to someone you choose, the power to act on your behalf in relation to medical decisions. It covers circumstances where you as the Principal are preparing for the possible eventuality of becoming incapacitated in managing your own health care alone. A health care proxy is also referred to as a medical power of attorney. This legal document allows you to appoint another person, your proxy, to make decisions about your health in the even that you are unable to do so. A medical consent form is a legal document that gives the medical provider consent to treat a person. These are often used when minors travel with someone other than their legal parent or guardian. The purpose of the form is to ensure that if something happens, the minor can get the treatment needed without delay. A personal finance statement is a document or a spreadsheet that shows your financial worth at any given point. This document includes a close look at your assets and your liabilities.